Pressure Cooker Potatoes are fluffy and tender on the inside and browned and crispy on the outside and tossed with herbs. You’ll be obsessed! Guys, I am kind of obsessed with these Pressure Cooker Potatoes. Family and friends will tell you that potatoes have always bee obsessed with potatoes. I’m kind of the potato girl. Usually, though, it’s the mashed or french fried variety. Now, with the pressure cooker in my life, these potatoes are quickly becoming my favorite weeknight meal side dish. How do you cook potatoes in the pressure cooker? Guys, it could not be easier to cook potatoes in the pressure cooker. You will need to use a steamer basket or trivet to hold the potatoes while they cook. As far as liquid goes, you need to have some when you cook with a pressure cooker. If you don’t have the right amount of liquid, there will be no steam, thus no pressure. For this recipe, I use one cup of water. How long does it take to cook pressure cooker potatoes? My pressure cooker (I use the Instant Pot) has been a life saver. It makes the BEST hard boiled eggs. I love the way it makes cooking brown rice a breeze. And it is FABULOUS for making Kalua Pork cutting down the time from 16 hours in the slow cooker to just two in the pressure cooker. Like I said it’s a time saver and this recipe is no exception. If you are a fan of potatoes that are crispy on the outside and light and fluffy on the inside, then you too are going to love these Pressure Cooker Potatoes too. They don’t take long to cook at all. I cook them for 5 minutes on high pressure and then do a 10 minute natural release. The potatoes would be perfectly tender and fluffy if eaten right out of the pressure cooker, but I like a little bit of a crisp to them. For this reason, I added them to a skillet with a little oil, butter and herbs to give them a bit of that golden crust. Which variety of potatoes do you use to make pressure cooker potatoes? 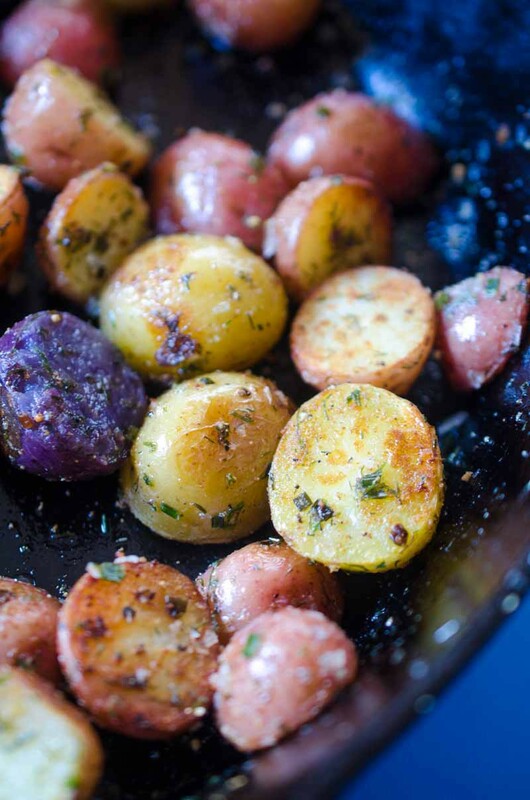 For these Pressure Cooker Potatoes, I used marble potatoes. I liked the variety of the baby purple, red and gold potatoes. I think that it makes a fun colorful dish. 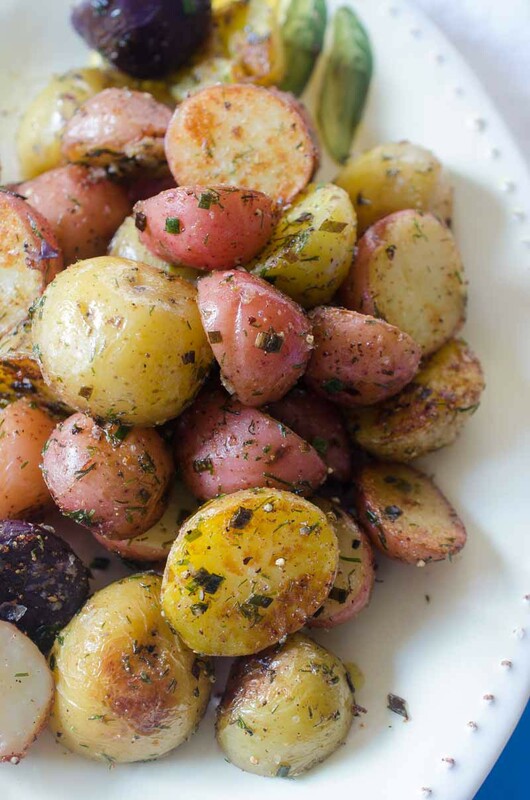 If you can’t find the marble potatoes you could use baby red or yukon gold potatoes, just cut them into large bite size pieces. As far as herbs go, I chose to use dill and chives. I think the two work really well together and give a bright flavor. Freeze dried herbs that worked great for this. I love using freeze dried herbs because they give you lots of freshness like fresh herbs but they last SO much longer. I have seen a few different brands but I happened to pick up the Litehouse herbs at Costco. I’ve been using them in everything. 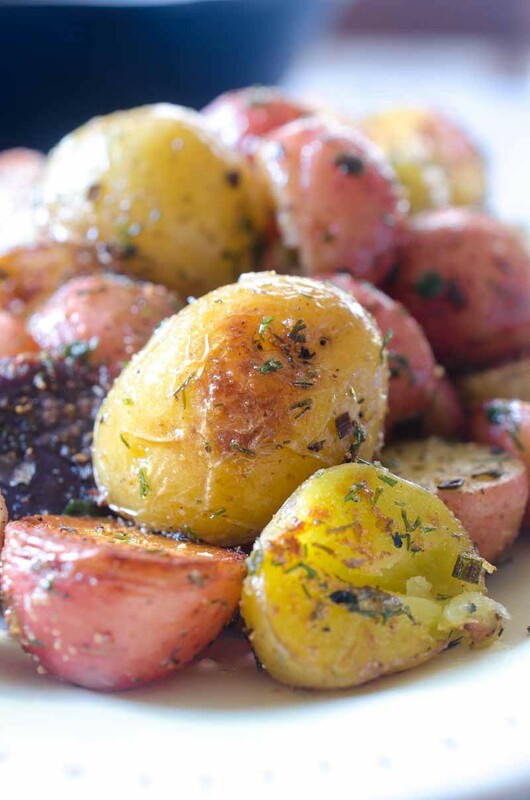 They make a great addition to dressings, sprinkled in pasta and of course, sprinkled on these Pressure Cooker Potatoes. Note: Originally posted in 2017. Updated with a new video 2019. Pour water into the bottom of a pressure cooker fitted with the steamer insert. Place potatoes in the steamer. Set the pressure cooker to 5 minutes under high pressure. Let the pressure natural release for 10 minutes. 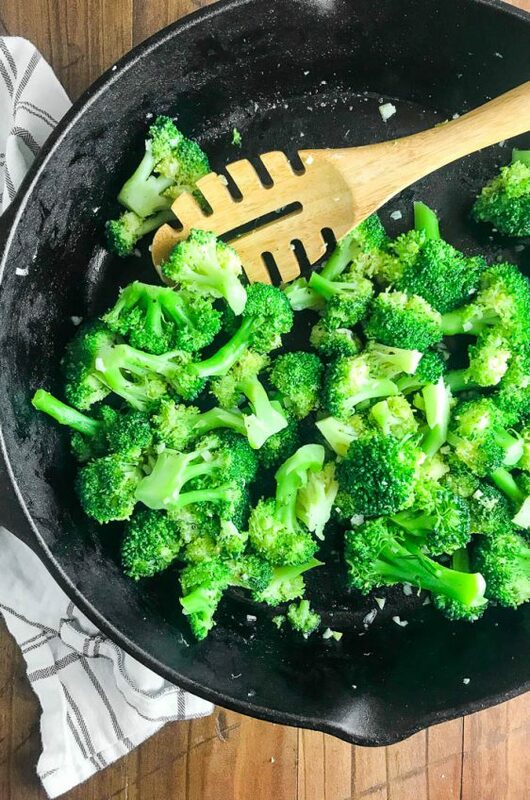 Heat butter and oil together in a skillet. Once the butter melts, carefully add the potatoes to the pan. Stir to coat. Sprinkle chives and dill over the top and toss to coat. Season to taste with salt and pepper. Continue cooking until potatoes are browned, about 5 minutes. Serve immediately. Nutrition facts not guaranteed to be accurate. I totally tried this at home but after 6 minutes and a 10 minute on low setting- my potatoes were hard as rocks? I ended up finishing them in a cast iron skillet. They were wonderful after that. I just can’t seem to figure out how to work my instant pot! Oh no! Was it just this recipe you had issue with? Or is it other things in your instant pot as well? They should’ve been very tender at that point. 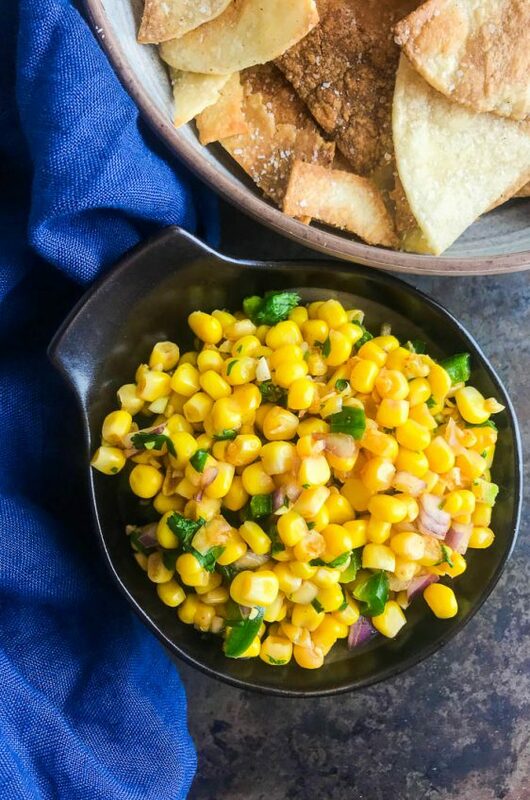 This is a great side dish! I have to make it for our next dinner! I love using my instant pot! 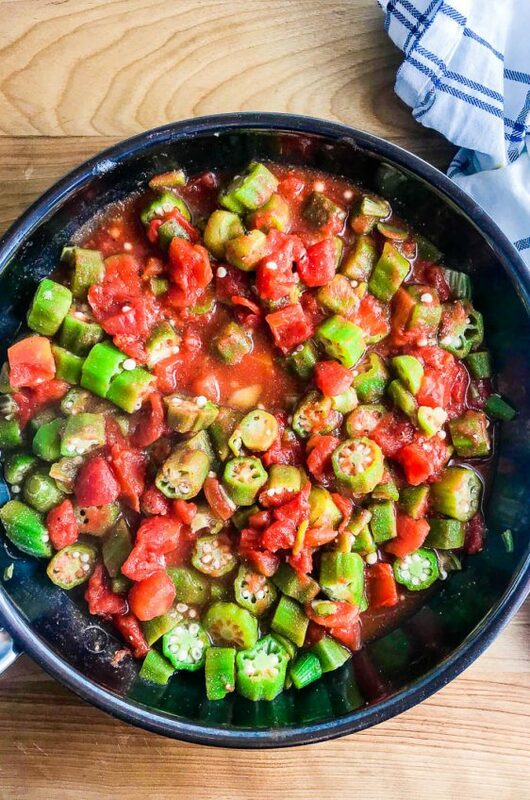 This recipe is so tasty and easy! Oh my goodness, these look absolutely sensational! So easy and crazy delicious, can’t wait to try! 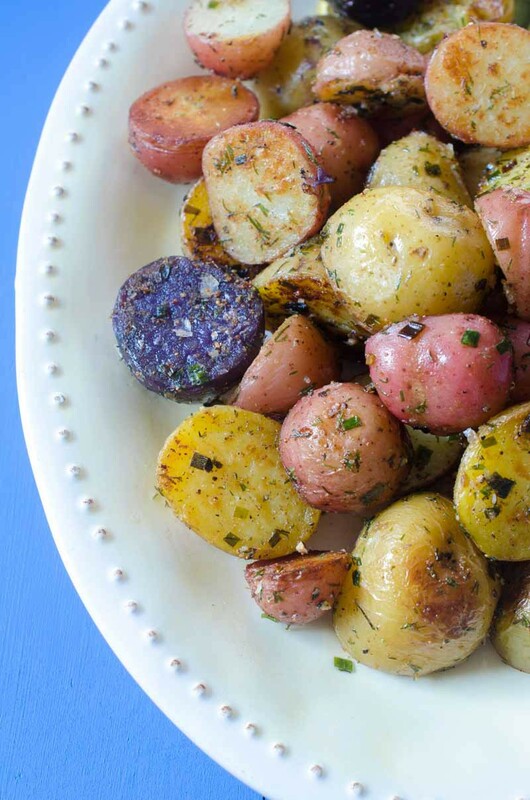 Potatoes are always the perfect side dish for any meal! I love how quick this recipe is! Those marbled potatoes are gorgeous! I love the texture you get in the Instant Pot! Yep, doesn’t get any easier than this! 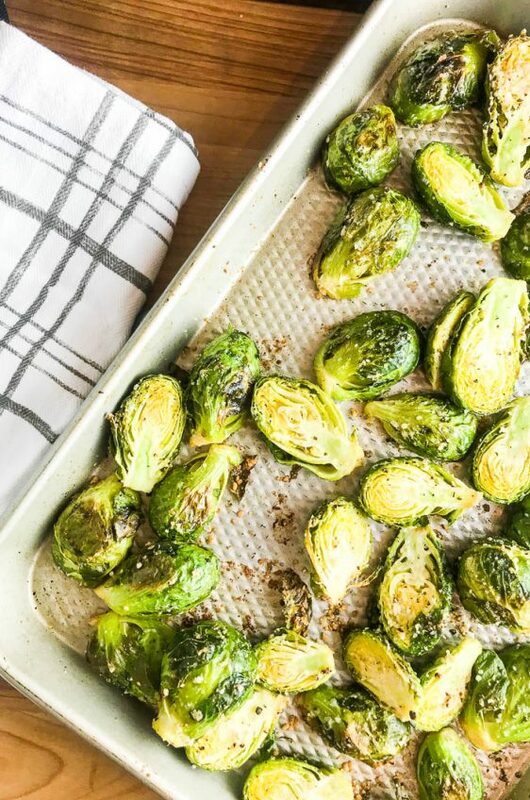 Such a great side dish to add to dinner. So easy. I can’t cook enough. They disappear! That’s great to hear Gray! I have to make these for a side dish this weekend! So easy and delicious! I need to make these soon! So tasty! What a great recipe, love how easy it is! Anyone with a pressure cooker has to try these right away, so good! I love potatoes! Will have to try these soon. I don’t have the electric pressure cooker. It may be a little harder to figure out the timing. I am going to try it though. There is no better side dish than the perfect potato – crispy on the outside and fluffy on the inside! 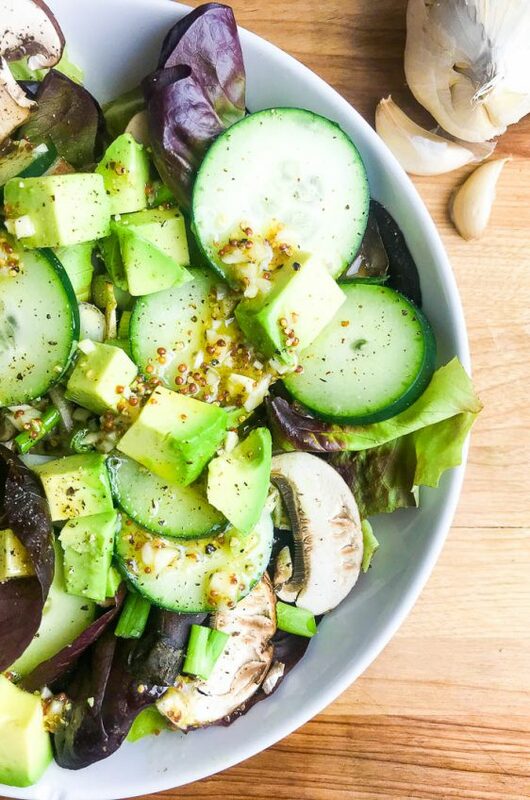 This looks delicious and so easy! Need to try it! I’ve never used a pressure cooker before. Clearly, I need to fix that and immediately make these potatoes. SO good! These look fantastic! I can’t wait to try these! Those colors are gorgeous! We love potatoes around here, but we get tired of the same old way. This looks so tasty! I really, really need to get a pressure cooker. 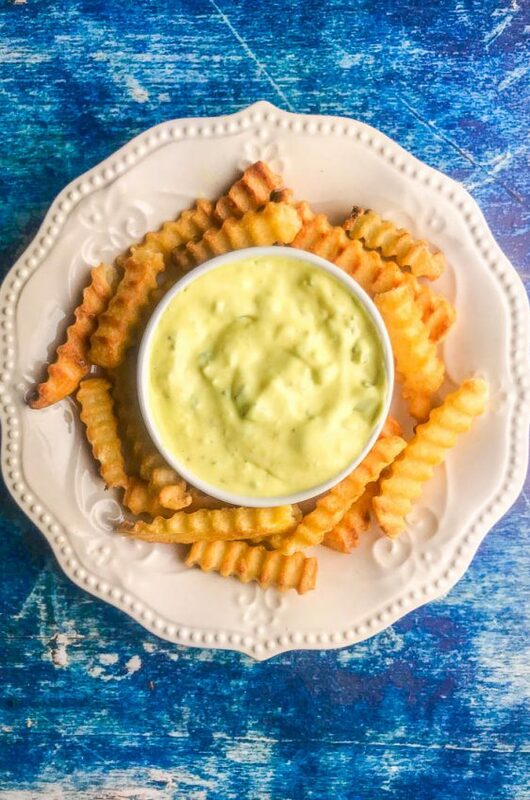 We love potatoes, and I love that you can make them so quickly! I love my pressure cooker! This looks so easy and yummy! I might even sprinkle a little parmesan on them too.